4th (Extra Reserve) Bn, The Kings (Liverpool Regiment), 98th Brigade, 33rd Division, B.E.F. 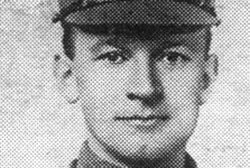 Mr and Mrs Williams of Fair View, Wells Road have been officially informed that their son Lieut John Victor Williams, Liverpool Regiment has been killed in action. He was at onetime employed at Messrs Schweppes at Colwall, and later moved to Leamington and Coventry and joined the RAMC at Birmingham soon after the outbreak of war. He saw service at Gallipoli and was invalided home and was subsequently commissioned in the Liverpools. The deceased was a Past Grand Master Master of the Loyal Wells Lodge of Oddfellows and took a keen interest in the old Colwall Football Club. Three brothers of Williams’ brothers served with the Colours, and a sister was working at a Casualty Clearing Station in France at the time of his death. There was a Requiem for him at Little Malvern Church, the Revd C R Fowke officiated on the 8th October 1917; and on Thursday, 12th a memorial was held at St John’s Coventry, where he was well known.